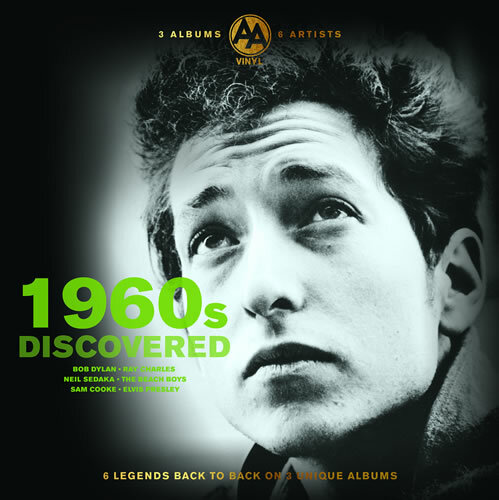 Introduces you to six of the most iconic 1960s artists of all time; Bob Dylan, Sam Cooke, The Beach Boys, Neil Sedaka, Ray Charles and Elvis Presley. 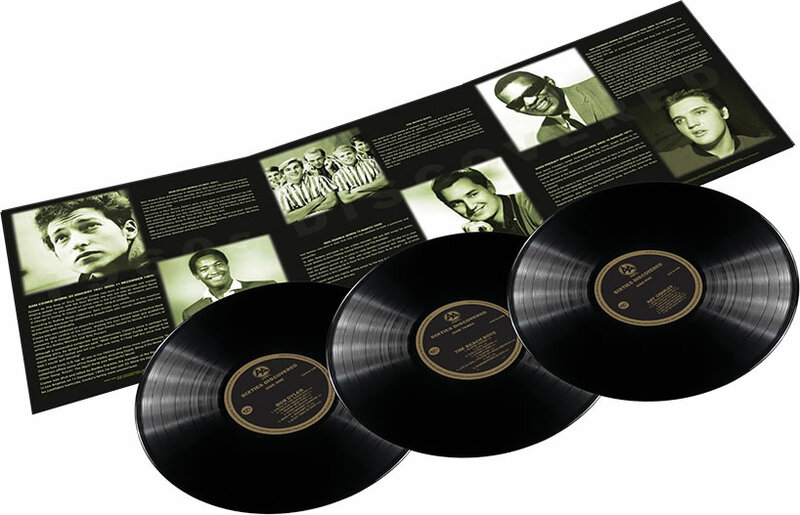 Released on the AA Vinyl Label, each of the six A-Sides features a selection of the artist's most influential music and finest work that helped establish them as true greats. There are no fillers, only A-Sides with timeless music from these six legendary 1960s artists. With detailed sleeve notes inside there is even more to enjoy besides the warm and rich sound of vinyl. Discover and experience the musical journey of 1960s DISCOVERED. The Sixties was a decade of social upheaval and social progression in America and music was at the vanguard. Slowly the old barriers seemed to be coming down. The Civil Rights Movement made its most strident protests against racial segregation at this time, and although the Civil Rights Act 1964 had come to pass, shifts in institutional attitudes had not yet taken place. Similarly, women demanded equality, equal pay and equal opportunities. This increasingly politicized environment gave rise to songs of protest and Bob Dylan, Sam Cooke and Ray Charles (featured in this collection) were instrumental in this trend. Elvis certainly cannot be said to have played a key role in the movement, even his detractors would have to concede he did more than most to bring to prominence black music, thus contributing to the breaking down of barriers. This was a period in which the countercultural urge saw young people turn their backs on mainstream culture. This counterculture was wholly anti-establishment in nature. It started in America before spreading out to engulf much of the western world. The countercultural impulse was given impetus through the Civil Rights Movement and took a revolutionary turn with the anti Vietnam War protests. Often seen as emerging after the assassination of President John F. Kennedy in November 1963, the countercultural movement was increasingly articulated through a perceived ‘generation gap’. Young people were calling all aspects of life, human experience and the American Dream, into question. This was articulated in a variety of ways including, alternative political models, alternative lifestyles, experimentation with drugs, sexual exploration and liberation, and a distrust of the authorities. Thousands of young people across America answered Professor Timothy Leary’s call to, “Turn on, tune in, drop out.” They embraced new musical styles and artists responded through increased experimentation, thus pioneering new music that stood out from the mainstream. The Beach Boys are a great example of this with their California Sound. As the decade drew to a close, there was also a shift away from the factory style of song production, so characteristic of the industry in the fifties, where professional composers produced hit after hit for artists. This period saw the rise of the singer songwriter and hit-maker Neil Sedaka who began to perform his own compositions. The decade was about so much more than the British Invasion, swinging London and the Mersey Sound. The story of the sixties is one of the old co-existing with the new and all the artists included here had a part to play. Welcome to this musical exploration of the sixties. Born Robert Allen Zimmerman in Minnesota, Bob Dylan has influenced in popular music and culture for over five decades. Much of his most celebrated work dates from the 1960s when his influence on the emerging counter-culture in America was most keenly felt. According to Paul Simon, Dylan’s early songs were so rich he defined the folk genre at the time. And yet it is as a songwriter that Dylan is perhaps most lauded and this selection brings you fine examples of both his ‘Dylan-esque treatment of established material (In my Time Of Dyin’ and House Of The Rising Sun) and his own compositions (Song To Woody and Talkin’ New York. With a voice famously described by David Bowie as “sand and glue”, Dylan has inspired a diverse range of artists including The Beatles, Johnny Cash, Sly Stone, Joe Strummer, Eminem and Bruce Springsteen. Known as The King of Soul, Samuel Cooke was born in Mississippi and started out singing gospel music with the Soul Stirrers. He was not only an important figure in soul music, he had an active role in the Civil Rights Movement, penning ‘A Change Is Going To Come’, which was often sung at protests. According to Rolling Stone magazine, Sam Cooke was influential in the invention of soul music because he combined a gospel style with secular material, marrying spirituality with sensuality. Cooke was very switched on about the music business and was one of the first black artists to take control of his career, starting his own record label and publishing company. It is through his businesses that Cooke helped to launch the careers of artists like Bobby Womack and Billy Preston. Cooke had 30 U.S. top 40 hits in his lifetime and three more posthumously and this collection offers some of his best tracks, including Cupid, Bring It On Home To Me, Chain Gang, Twistin’ The Night Away, Wonderful World, and Bring It On Home To Me. Cooke was shot and killed by Bertha Franklin, the manager of the Hacienda Motel in Los Angeles on 11 December 1964 and he died at the age of 33. While his death was found to be justifiable homicide, Cooke’s family were unconvinced. The Beach Boys consisted of brothers Brian, Dennis and Carl Wilson plus their cousin Mike love and friend Al Jardine. Together they helped develop the California Sound, starting out by recoding surf songs before moving into more innovative and experimental terrain. They began as a garage band and were managed by their father, Murry Wilson. This selection of tracks featuring their early work simultaneously offers a sense of where the band started and where they were headed with songs like Surfin’ Safari, 10 Little Indians, Surfin and 409. The latter being named after the Chevrolet 409, starting the hot rod music craze of the sixties. It also includes the rare track, Luan. Neil Sedaka was born in New York City and has excelled as both a performer and songwriter. To date, Sedaka estimates he has written between 700 and 800 songs for artists including Frank Sinatra, Elvis Presley, Connie Francis and The Monkees. After establishing himself as an artist in 1958, Sedaka turned out hit after hit in what was a golden period for him up to 1962, with songs like Calendar Girl, Happy Birthday Sweet Sixteen, Breaking Up Is Hard To Do and Next Door To An Angel - all of which can be heard in this collection. He moved back into mainly writing songs by the end of the sixties but continues to perform and record to this day. Ray Charles Robinson, often referred to as The Genius and nicknamed The High Priest of Soul. Blind from the age of seven, Charles cited Nat King Cole as his key musical influence. Charles contributed to the racial integration of country and pop music during the 1960s achieving a crossover success few artists experience. On this compilation, the range of Charles’ work is evident with tracks including Georgia On My Mind - a Recording Industry of America’s Song of the Century - as well as Hit The Road Jack, and I Can’t Stop Loving You. Ray Charles is one of those artists that seem to have influenced almost every musician that came after them. Nora Jones, Van Morrison, Joe Cocker, Michael Bolton and Daryl Hall, and Willie Nelson acknowledge his influence on their careers. Elvis Aaron Presley’s career mushroomed in the 1960s, largely thanks to his crippling film production schedule which often saw The King starring in up to three musical movies a year in this period. So in demand at the studio was he that he made 27 films in the sixties with 15 of these being accompanied by soundtracks. No-one ever accused Elvis of being a slouch. Some of the tracks in this selection reflect the symbiosis between Elvis’ films and his sixties chart releases. Rock A Hula Baby and Can’t Help Falling In Love featured in Blue Hawaii while Wild In The Country comes from the film of the same name. This collection also includes the magnificent song, Surrender, one the King’s biggest ever selling singles.